For those who are in the London area on Friday and Saturday this week, remember to pay a visit to the ABA Antiquarian Book Fair and view the fantastic range of books, available for sale. You will find 70 top antiquarian book dealers from the UK and overseas, exhibiting their treasures at the 2 day fair this year. The fair, held at the Chelsea Old Town Hall on King's Road, opens to the public on Friday, 2nd November from 2pm -7pm and continues over to Saturday, 3rd November, from 11am - 5pm. The catholic holiday All Saints, is celebrated in many catholic areas of Germany. As Dusseldorf is in one of the areas, our European offices will be closed for the bank holiday on Thursday, 1st November. Customer Services will resume as normal again on Friday, 2nd November. UPDATED: All maintenance to the telephone system has been completed and telephone customer service is now available again. Due to telephone maintenance on Wednesday 31st November, our Customer Service team will only be reachable via email for a period of 3 hours between 7am - 10am GMT. The telephone system should be operational for incoming calls again by 10:30am GMT and Customer Service will function as normal from there on. Please be advised that the email system will be fully operational throughout this period and you can still contact the Customer Service Team using the contact form. You may also wish to enter a Call Back Request from your Members Menu, giving a brief description of the issue or query you may have and the number on which you are reachable so that one of our Customer Service representatives can call you back once the system is back in operation. Starting this month, we will begin running a series of articles highlighting AbeBooks' subsidiary companies: who they are, what they do and how they can help you! The first featured subsidiary is FillZ. Who are FillZ? FillZ was co-founded in San Francisco in 2004 by the current CEO Miron Cuperman, and was subsequently purchased by AbeBooks in February 2006. Currently, employees of FillZ are based in bothSan Francisco and Victoria, BC. What is FillZ? FillZ is a web-based inventory, re-pricing, and order management tool that allows booksellers to easily list books on up to 18 worldwide online marketplaces. FillZ technology enables booksellers to upload their inventory once, and manage updates once, rather than having to replicate these actions for every marketplace. As FillZ is web-based, there is no hardware or software to install or to buy, and booksellers can get started using FillZ immediately and easily. Where can FillZ list my Inventory? FillZ supports up to 18 marketplaces including Amazon.co.uk, Amazon.com, Amazon.ca, Amazon.de, Amazon.fr, AbeBooks (.co.uk, .com, .de, .fr), ChooseBooks.com, Alibris.com, Biblio.com, Chrislands.com, and others. FillZ can also support inventory on other marketplaces that use “FTP inventory uploads” such as A1 Books and Books & Collectibles. Why Should a Bookseller Use FillZ? The FilllZ tool has simplified the complexities of bookselling through a number of online marketplaces. Because of this, booksellers can easily grow their online sales channel by adding additional marketplaces. This typically translates into a sizeable increase in sales. When Does it Not Make Sense for a Bookseller to use FillZ? FillZ probably does not make sense for a bookseller that sell less than a few thousand pounds per month across multiple marketplaces as there is a fee to pay for using it. However, adding marketplaces does increase sales, so it might be interesting to give it a try regardless, taking advantage of the 30-day risk free trial that FillZ offer. How Can I find out More Information about FillZ? You can visit our website at www.fillz.com, or you can contact Lee-Ann Gavin (Account Manager) at leeann@fillz.com. We have noticed that some sellers are experiencing problems in getting their books back online, when reactivating their accounts after a vacation period. To avoid any unnecessary delays in getting your inventory back online, we recommend that you contact the AbeBooks Customer Service Team 48 hours before you would like to have your books re-listed. They will contact the technicians directly to ensure that your books are re-listed on time. We are writing to inform you that we will be moving some of our data storage facilities on the early morning of Wednesday, October 24th, 2007. This move will result in a site outage of approximately 1 to 3 hours duration, beginning at 2.00 a.m. GMT. During the outage, users will experience varying levels of site functionality. Please be assured that we will make every effort to keep the outage a brief as possible. This move is the first step in a two-step process. The second step will take place in November and we will notify you in advance of any site outages that may result. Please also note: During this week, you may receive AbeBooks order notifications with some delay. We therefore recommend that you sign on to your Members Menu on a daily basis to check whether you have received any new orders. If you have any questions or concerns, please feel free to contact Customer Service. The Bookstore location search facility is now available on all of the AbeBooks platforms. By adding the correct county code to your book store address you can ensure that buyers in the UK, looking for booksellers in their area, will be able to find your bookstore too. Simply add the 3 letter county code to the [State/Province Code] field of your address details and buyers will be able to find your store on the bookstore search. Make sure you are using the information fields correctly - it is to your advantage if your details are clear and concise for buyers. Make sure you have read the information on the appropriate use of the information fields on your account before updating your terms of sale and shipping terms - Information Fields. Use your book descriptions wisely. Do not waste valuable book description space for your Terms of Sale. Your Terms of Sale are visible on each book search result and should not therefore be added to the book description. FACT: The majority of buyers using the site use the keyword search to find the books they want - the keywords they use are book specific - content, condition, publisher, genre etc. Buyers searching for books will be looking for information on the book itself NOT the shipping costs or terms of sale. Use the Terms of Sale to promote your conditions - e.g. "orders processed and sent within 4 days, no quibble refund if item returned within 14 days of receipt, etc." Make direct payment methods easier, quicker and clearer by entering the details of your paypal account, or the details for cheque payments, for example, in that field. Make buyers aware of any special offers you may be running - buy 1 get 1 free, 10% discount for all students, etc. Give more detailed information about your shipping costs and speeds - based on weight for example, or on the customs delay that may occur when sending to the US for example. All you need to know about your bookseller account in a nut shell. Learn about the most important features of your bookseller account by downloading one of our new bookseller guides. We have prepared 3 comprehensive guides, each specific to the different types of book data format used on AbeBooks, for your use. You will find details of how to use your Members Menu effectively. This includes the instructions for processing your orders properly, what to do in case of a return/refund, how to access and update your account information, where and how to upload your book data and more. 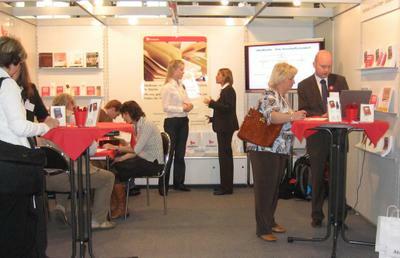 AbeBooks enjoyed a very successful Book Fair in Frankfurt this year. We were fortunate enough to have a large booth at the entrance of Hall 4, which attracted a lot of attention from both buyers and sellers. With over 7,400 exhibitors from 108 countries, spread throughout the 8 trade halls, the Frankfurt Book Fair, offered a fantastic opportunity to promote AbeBooks' services within the book selling industry, as well as to the general public. AbeBooks staff, from our English, German, French, Spanish and Italian teams, were on hand over the course of the 5 day fair to meet with existing partners, to acquire potential partners and also to promote AbeBooks to the book buying public who visited the fair over the weekend.